The Triton One is an evolutionary speaker that builds upon all the advanced technologies that have made the Tritons famous. (In response to questions, there is no Triton One+ coming. The “+” in the new Triton Three+ and Two+ is technology already in the One.) The sleek 54″ tall Triton One’s upgraded technology includes a 56 bit DSP engine for the sub section, a fully balanced crossover design, high-end film capacitors, advanced cabinet design, and much more. The Triton One includes a built-in subwoofer section powered by a 1600 watt GoldenEar ForceField digital amplifier. The amp drives three 5″ x 9″ front-mounted quadratic subwoofer bass drivers which are coupled to dual (per side) side-mounted 7″ x 10″ quadratic planar infrasonic bass radiators. Our newly developed Frequency Dependent Bass Loading Technology, utilizing open-cell polyurethane foam damping pads, as well as special hollow-fiberfill, further optimizes low-frequency performance. There are two newly designed 5-1/4″ cast-basket midrange/upper bass drivers, which incorporate GoldenEar’s proprietary Multi-Vaned Phase Plug (MVPP™) design, housed in dual discreet midrange chambers, arranged in a D’Appolito array surrounding the extraordinary GoldenEar High-Velocity Folded Ribbon (HVFR™) tweeter. The result is a superb, Loudspeaker-of-the-Year award winning reference home audio and home theater loudspeaker that has performance equal to, and in many cases surpassing, speakers selling for ten times its cost. The Triton Series Towers are high-performance loudspeakers, with the top four models including a built-in powered subwoofer. All the Triton Towers are engineered for superb performance in both high quality two channel stereo systems as well as in multi-channel home theater and music systems. Their sleek, elegantly curved and tapered design is not only gorgeous but is important from a performance perspective as well. 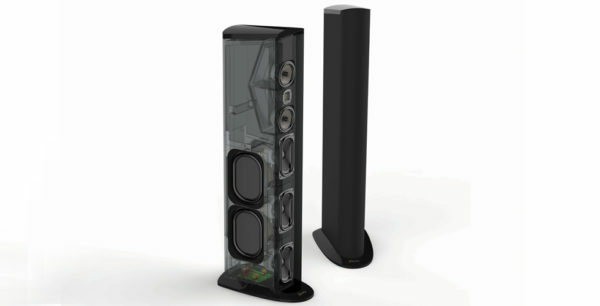 Performance-wise, the Triton Towers all deliver boxless three-dimensional imaging, which reviewers have hailed as “mystical”, “magical” – and, best summed up by the dramatic, “had us believing that the entire surface of the front wall was covered with speakers.”. Likewise, the powerful, deep subwoofer bass blends perfectly with the silky smooth, utterly transparent midrange and high frequencies, putting many dramatically more expensive speakers to shame. The powered subwoofer sections in each Triton Reference, Triton One, Two+ and Three+ incorporate a high power GoldenEar ForceField digital amplifier. The amplifier’s DSP design not only yields extremely linear and low distortion response, but also dynamically controls operating parameters for optimum performance. The amp drives up to three front-mounted quadratic subwoofer bass drivers which are coupled to multiple side-mounted quadratic planar infrasonic bass radiators. The result is awe-inspiring bass, which delivers both musical subtlety as well as room-shaking authority. The advantages of building the subwoofers into the Tritons are many. First, of course, this eliminates the need for additional subwoofer boxes in the room. But more important are the performance advantages. 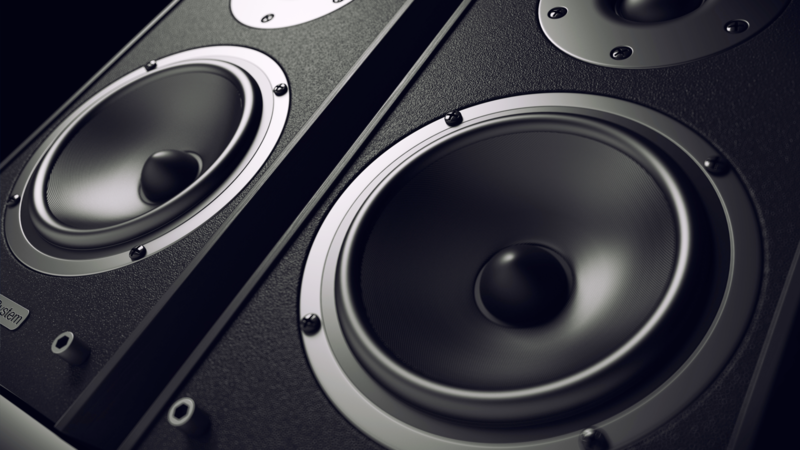 By engineering the subwoofer as an integral part to the speaker, we get far superior integration and blending than can be achieved with separate subwoofers, even when using two. The two subwoofers in a pair of Tritons couple better to the air in the room, helping to better deal with the room’s eigenmodes and smooth out response. Of course, the dual subwoofers are also intrinsically more powerful and couple together synergistically for more truly exceptional bass. The Triton Tower’s striking, but harmoniously minimalist design, can fit nicely into a great variety of decors while going almost unnoticed. Their sleek, narrow baffle, sophisticated look also helps the speakers create truly magnificent 3D imaging with tremendous depth, height and width that extends well beyond the loudspeakers themselves. As with all GoldenEar speakers, development work is conducted at our Arnprior, Canada engineering facility utilizing our full-size anechoic chamber, which is an exact duplicate of the chamber at the NRC in Ottawa Canada, in combination with intense critical listening. Visually, the flagship Triton Reference offers a strikingly beautiful upgrade to the classic Triton styling, with a gorgeous hand-rubbed piano gloss-black lacquer finished one-piece monocoque cabinet. Sleek, statuesque and refined, the Reference is simply a gorgeous statement piece that will excite listeners with its dynamic visual presence, as well as its extraordinary sonic performance.